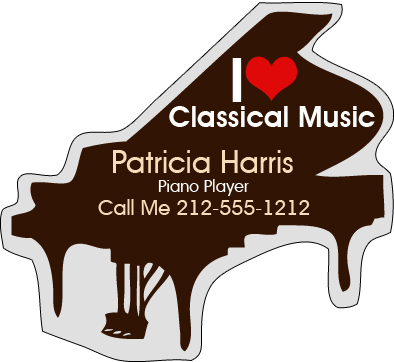 Perhaps you don’t want to strike a wrong chord and jeopardize your music business, take a look at this adorable custom 2.5 x 2.625 piano shaped full color musical refrigerator magnets– 20 MIL and you’ll know how to play it right. This magnet is perfect for promoting any kind of music business or musical concert or musical. It is perfect for year around brand building due to its typical shape. It offers large space for imprinting your logo, slogan or other business information. Request a quote to know discounts that can be availed on bulk orders of these customized 2. 5 x 2.625 piano shaped full color musical refrigerator magnets– 20 MIL. Imprint area – 2.25x 2.25. Product Size : 2.5in. x 2.625 in.